Commenting on the results, Prof Mason said: "It's not catastrophic, the numbers that we're seeing, but it is concerning." This latest work comes amid growing international attention on plastic, fuelled by the BBC's acclaimed Blue Planet 2 series in which Sir David Attenborough highlighted the threat of plastic waste in our oceans. To eliminate any risk of contamination, purchases in shops and deliveries to courier companies were recorded on video. Some packs in the US were ordered over the internet. The screening for plastic involved adding a dye called Nile Red to each bottle, a technique recently developed by British scientists for the rapid detection of plastic in seawater. Previous studies have established how the dye sticks to free-floating pieces of plastic and makes them fluoresce under certain wavelengths of light. Prof Mason and her colleagues filtered their dyed samples and then counted every piece larger than 100 microns – roughly the diameter of a human hair. Some of these particles – large enough to be handled individually - were then analysed by infrared spectroscopy, confirmed as plastic and further identified as particular types of polymer. Particles smaller than 100 microns – and down to a size of 6.5 microns – were much more numerous (an average of 314 per litre) and were counted using a technique developed in astronomy for totalling the number of stars in the night sky. The make-up of these particles was not confirmed but Prof Mason said they can "rationally expected to be plastic". This is because although Nile Red dye can bind to substances other than plastic - such as fragments of shell or algae containing lipids - these would be unlikely to be present in bottled water. Since the study has not been through the usual process of peer review and publication in a scientific journal, the BBC has asked experts in the field to comment. Dr Andrew Mayes, of the University of East Anglia and one of the pioneers of the Nile Red technique, told us it was "very high quality analytical chemistry" and that the results were "quite conservative". Michael Walker, a consultant to the Office of the UK Government Chemist and founder board member of the Food Standards Agency, said the work was "well conducted" and that the use of Nile Red has "a very good pedigree". Both of them emphasised that the particles below 100 microns had not been identified as plastic but said that since the alternatives would not be expected in bottled water, they could be described as "probably plastic". One obvious question is where this plastic may be coming from. Given the amount of polypropylene, which is used in bottle caps, one theory is that the act of opening a bottle may shed particles inside. To check that the process of testing was not itself adding plastic to the bottles, Prof Mason ran "blanks" in which the purified water used to clean the glassware and the acetone used to dilute the Nile Red dye were themselves investigated. Small quantities of plastic were found in them – believed to be from the air - but these were subtracted from the final results. A surprise to researchers was the wide variety of findings – 17 of the 259 bottles tested showed no evidence of plastic but all of the rest did, with big differences even within brands. 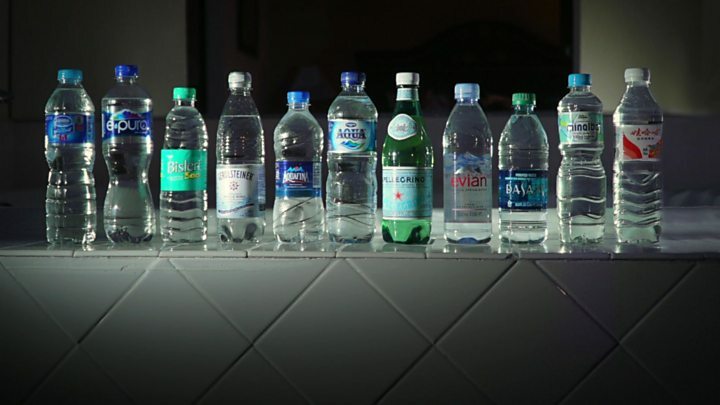 A few bottles were found to have thousands of particles - the vast majority being the smaller ones that are "probably plastic" - but others from the same pack had virtually none. We contacted the companies involved and most responded. Nestle told us its own internal testing for microplastics began more than two years ago and had not detected any "above trace level". A spokesman added that Prof Mason’s study missed key steps to avoid "false positives" but he invited Orb Media to compare methods. Gerolsteiner also said it had been testing its water for microplastics for a number of years and that the results showed levels "significantly below the limits for particles" set for pharmaceutical companies. It said it could not understand how Prof Mason’s study reached its conclusions. It also said its measures exceeded industry standards but added that microparticles are "everywhere" so "the possibility of them entering the product from ambient air or packaging materials during the bottling process can therefore not be completely ruled out". Coca-Cola said it had some of the most stringent quality standards in the industry and used a "multi-step filtration process". But it too acknowledged that microplastics "appear to be ubiquitous and therefore may be found at minute levels even in highly treated products". Danone said it could not comment on the study because "the methodology used is unclear" but added that its own bottles had "food grade packaging". It pointed out that there are no regulations on microplastics or a scientific consensus on how to test for them, and it also highlighted a much smaller German study last year that found plastic particles in single use bottles but not above a statistically significant amount. PepsiCo said Aquafina had "rigorous quality control measures sanitary manufacturing practices, filtration and other food safety mechanisms which yield a reliably safe product". It described the science of microplastics as "an emerging field, in its infancy, which requires further scientific analysis, peer-reviewed research and greater collaboration across many stakeholders".